I seem to collect sports club membership like people collect stamps! I am a member of more than one cycling club, and a member of a hockey club. As for running, I am first claim at Serpentine Running Club, second claim at South London Harriers, and I am now also a member of a running club in Yorkshire which I run with when I visit my family in East Yorkshire. 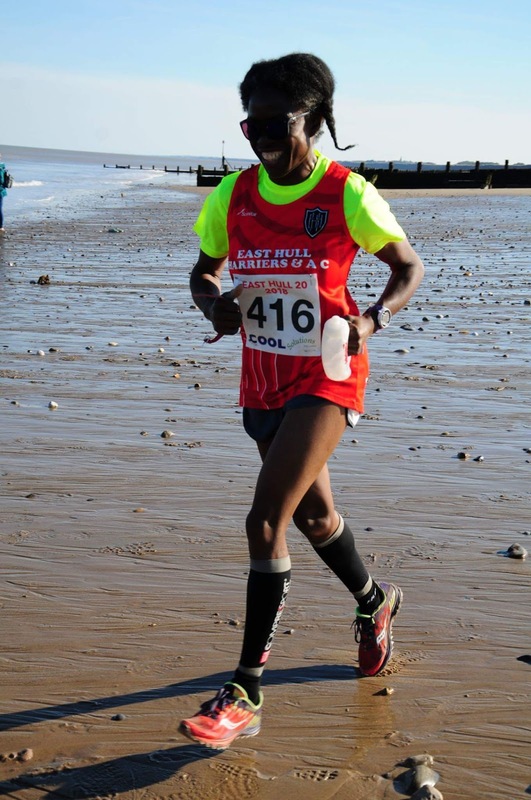 East Hull Harriers are a very friendly club, and they have been very welcoming when I have been up and run with them. I have done their Saturday afternoon Pack Runs, group runs in the rural villages to the north and east of Hull, and I attended their 125th anniversary club dinner earlier this year. At the back of the pack and enjoying it! I was really pleased to get out and do the first race of the winter handicap league, the Hornsea Beach race. When doing running races we get to run on a variety of terrains, but I don't know a time when did a race on the beach. The sand was compacted so it wasn't too hard to run through, however the tide was coming in, so there were parts where we just had to run straight through the water. I did try as much as possible to avoid getting my feet wet, and probably ended up running further than the advertised 6 miles! Also, another small detail was that I missed the start by a few minutes as I couldn't find the steps to get down from the road onto beach. So it was a heartsink moment to hear the whistle go, and see a sea of red running shirts sail off into the distance while I was still on the road! I also felt a bit silly, once I eventually got onto the beach, being a lone runner with a race number on, and no one else around me. Funnily enough, despite my late start I managed to catch a few of the back markers so I wasn't in last place in the scratch rankings - though I probably am on handicap. But hey, it was a pleasant afternoon, and as ever it was good to catch up with them for the first time since May.